Palmer Engineering was selected by the Madison County Fiscal Court to provide roadway engineering services for KY-876 improvements. This project consisted of 4 sections and was approximately 4 miles in length with 3 stream crossings. 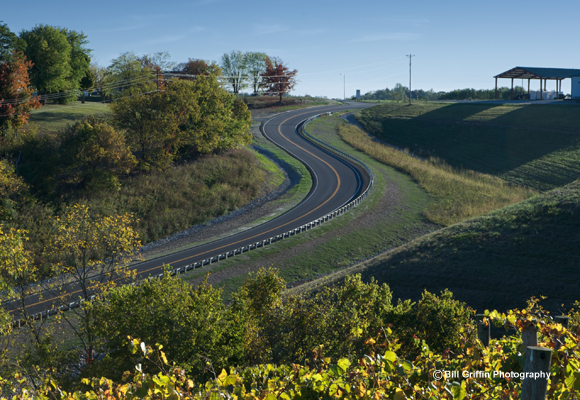 The improvements corrected the narrow lanes and shoulders along with curve deficiencies, which had previously required constant maintenance by KYTC. The proposed alignment was developed so that traffic could be maintained along the existing alignment with only short closure periods because of the Acres of Land Winery, located near the end of the project. Working within funding restraints, the proposed alignment minimized the construction cost by reducing the excavation and extending the existing culverts. The design process for this project was expedited so that construction could begin as quickly as possible. A key element to beginning the construction process was obtaining the right of way, utility relocation, and proper permits. Palmer Engineering received the 2013 ACEC Honor Award in Engineering Excellence for our work on KY-876.